Looking to Treat Diabetes Naturally or Diabetes Solutions? An estimated 23 million Americans live with diabetes. This disease has two main causes. The body doesn't produce enough insulin to adequately convert food into energy or the body does not adequately recognize the insulin leading to the same result. 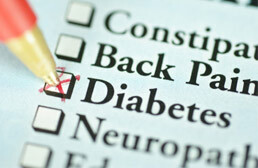 Often diabetes can be controlled through lifestyle changes alone. This diabetes solutions are the first approaches one should take when looking to treat diabetes naturally. Still many people need daily shots of insulin or medications to keep their blood sugar levels under control and these lifestyle approaches will not be enough. In this case higher interventions are needed that your diabetes doctor will recommend. You should know that high blood sugar levels are responsible for the link between diabetes and heart disease. When blood sugar levels are too high, it can cause damage to the blood vessels that circulate blood to and from the heart as well as other organs. Over years the internal damage leads to major problems with your heart health and other organs like kidney, eyes, digestion, etc. Here at Southwest Integrative Medicine, our doctors help manage diabetes, treat, and find natural diabetes solutions. For those with pre-diabetes, metabolic syndrome, and other blood sugar dysfunctions, weight loss play a key role. We have phoenix weight loss solutions to prevent diabetes from occurring. For prevention of diabetes and heart disease through various alternative approaches, from nutrition and herbal medicine to acupuncture and hormone imbalances, we have your diabetes solutions covered.